Well� not really, I divided it in half though , and I put in a second stack. 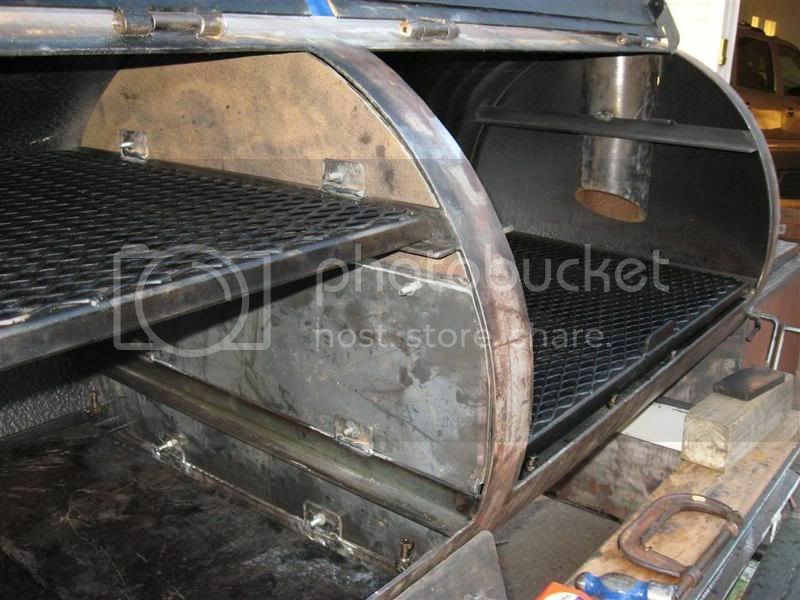 Now I have a conventional offset/reverse/ two in one smoker�whatever you call it, I just hope it works! If not, I�ll make it work. Three pieces made up the divider, one short piece on the bottom, (this one will have slotted holes for adjustment) the large middle piece and the top piece, all held together with 5/16 bolts (welded) very easy to remove! 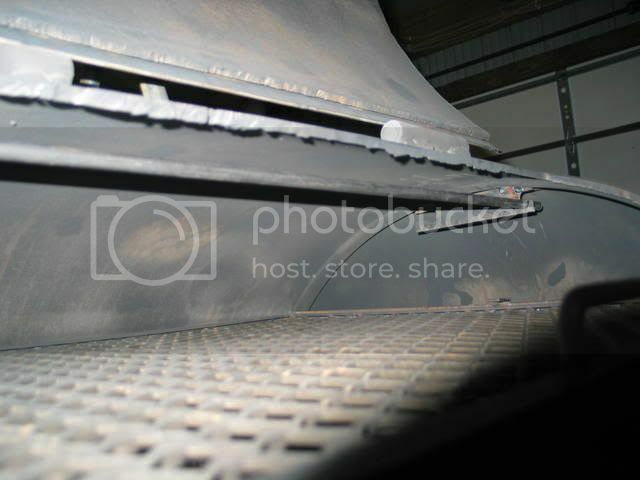 The tuning plates are but- up together with a four inch opening at the end for heat/smoke reverse flow. Very well done Joe! See no reason she won't work that way for you. I had the same idea when I built the twins. Good luck it should work fine. I'll tell you what .You're just smarter than a good show dog !! 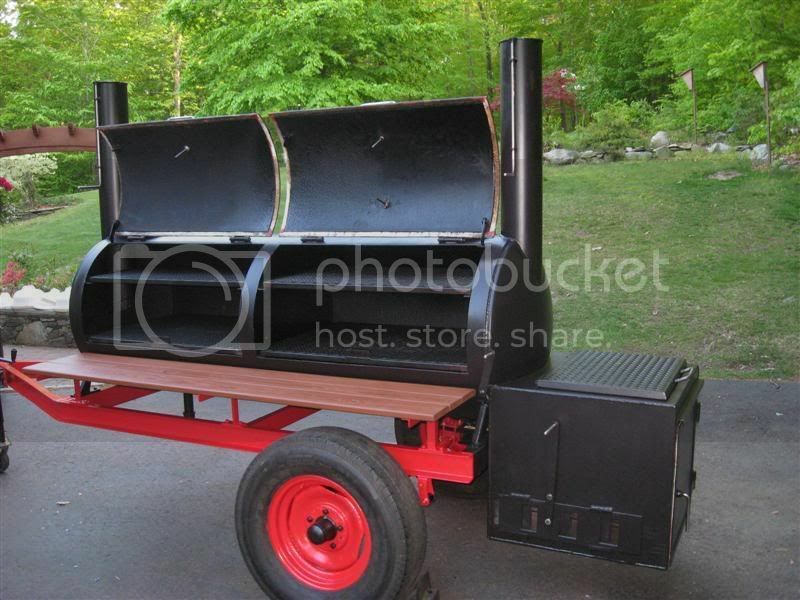 That is funny... thanks, I like the sausage hanging rods idea, my upper cooking tray is only 6" from the top, so I might just remove the top tray and hang the rods on the angle iron sliders. Its a long learning experience guys. 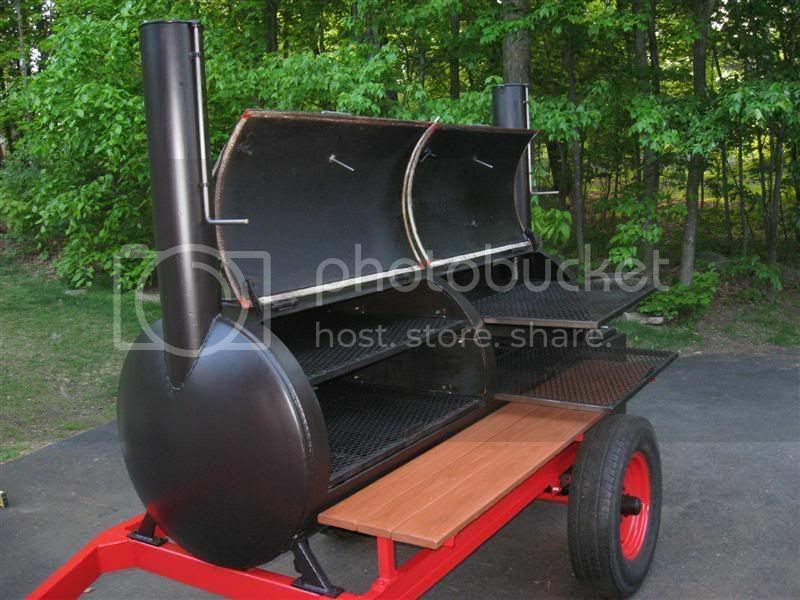 How do you open up the left side to allow heat in when using it for large cooks, pics if possible. I just slide out the cooking trays, unbolt and remove the divider plates all together which takes only 5 minutes; I adjust the tuning plates back to their original marks and she's ready to roll. Ya know, I am really liking the pits that are red and black. JoeD, that was a good idea on the splitting. The MAIN reason I didn't make this last pit out of a propane tank I have is because I don't usually cook for a crowd, mainly just for me and the wife. 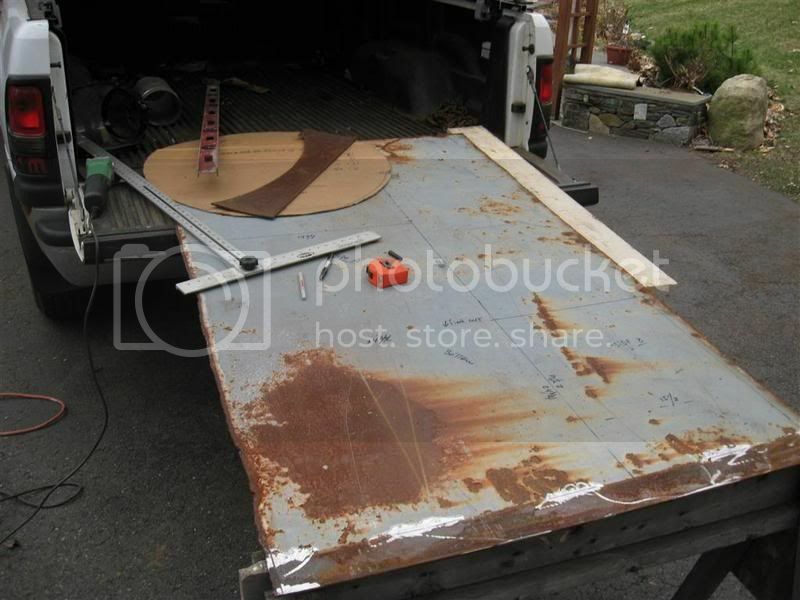 This pictorial showing how to go about possibly splitting it kind of has my welding rod holding hand twitching a bit! 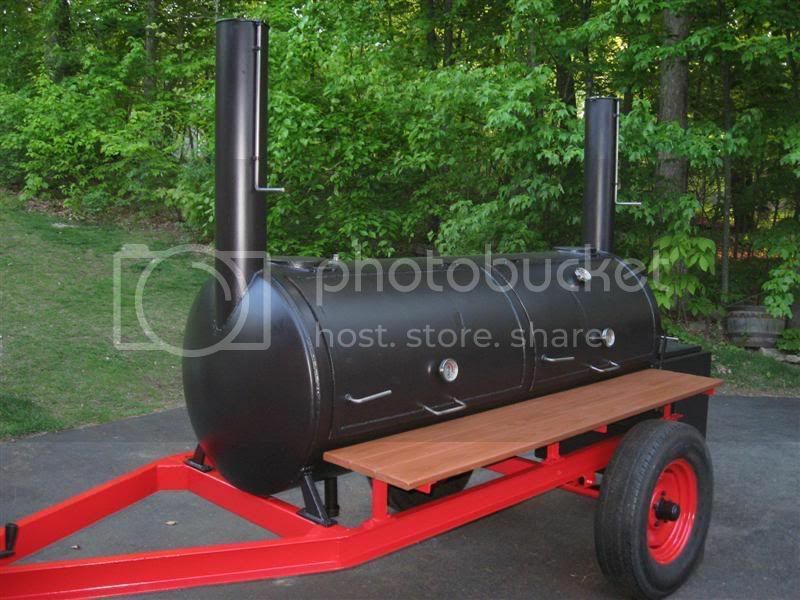 One question, now that you've done the split, have you seen a reduction in the number of sticks it takes to keep her at temp for a long smoke? 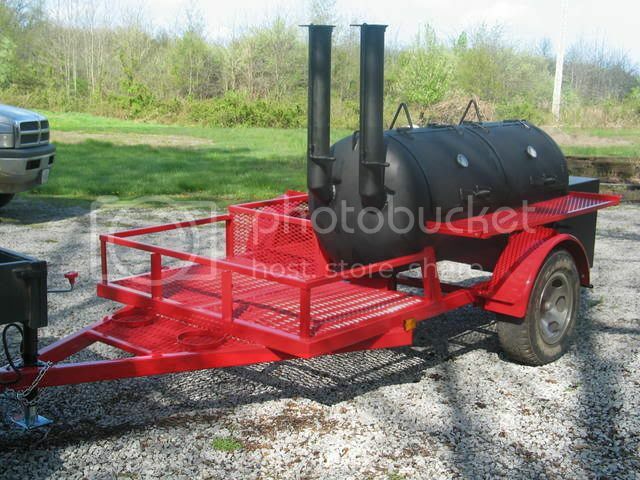 Aye, i like the red and black combo myself, since my truck is red with black trim as well. 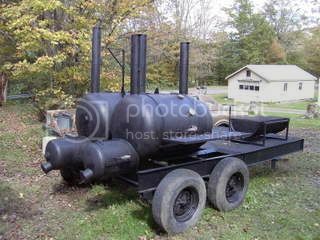 Thats why i built mine the way i did CB, I dont need a big cook area for just the family, if i wanna grill i close the partition door to the smoker, if i wanna smoke i lay the deflector plate in the bottom on the grill side and open up the paritition door to the smoker. Paint really sets one off. Yours is looking really good. You can tell that there is a lot of thought there on that build. Congrats !! I also like the shelf , is it redwood ? Red and black rulz ! 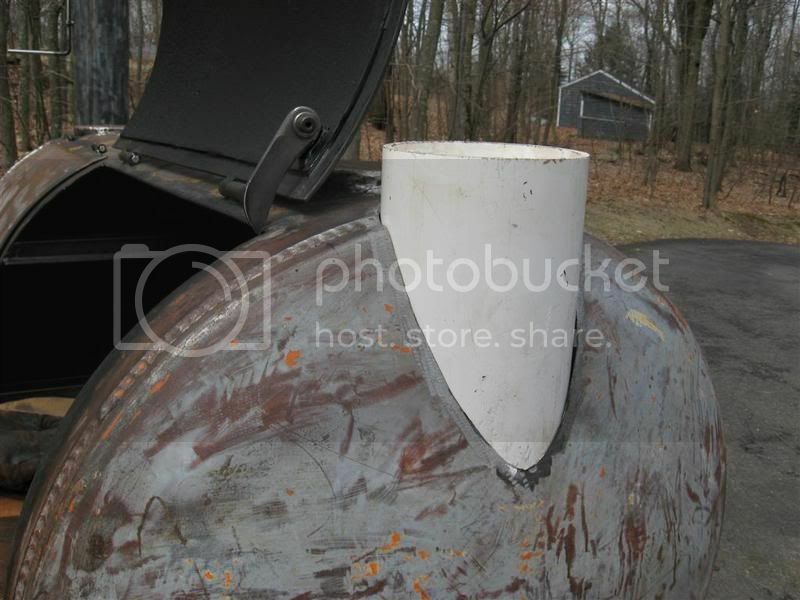 I haven't burn sticks only since I "cut" the smoker, you can click the following link http://www.thesmokering.com/forum/viewtopic.php?t=16869&highlight= and read about the test I ran after insulating the fire box and installing the divider plates. 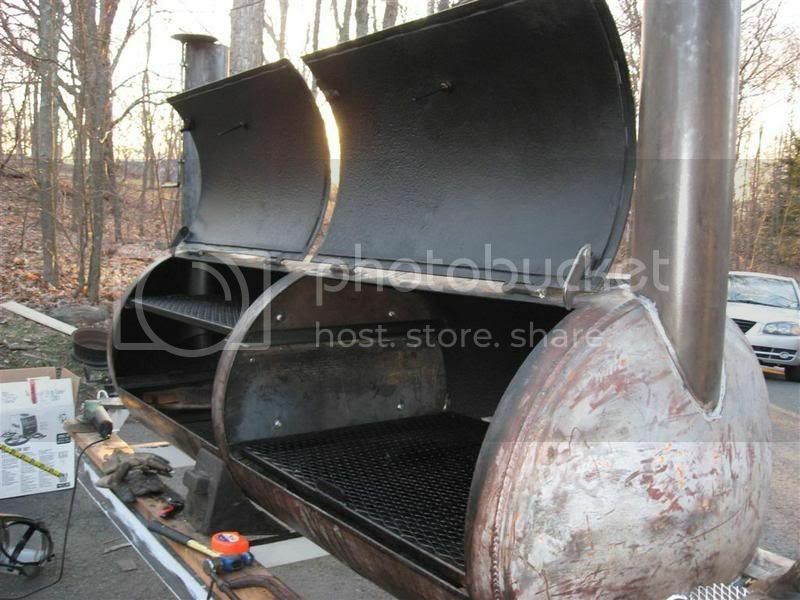 Since the changes, I can assure you that this smoker became very efficient and easy to maintain steady temps considering the size and overall design. 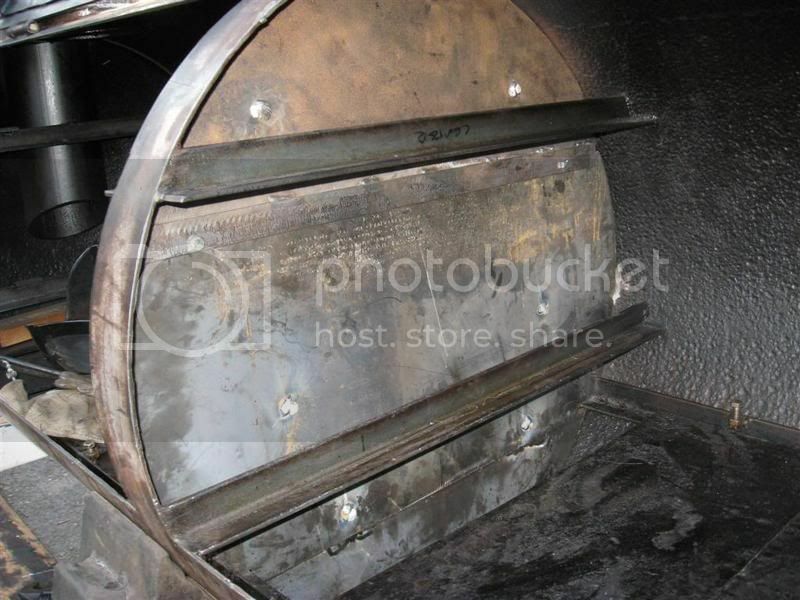 Also, installing gaskets on the fire box and cooker doors was the key for long and better controlled burning time. Why are the smoke stacks extended down to the lower grate level. Doesn't this cool down the top level? Just curious. Negative my friend, heat rises so the top cooking grate gets slightly hotter then the bottom grate. The temperature difference varies depending on what I cook, for example; I've seen as much as 30* difference between the top and bottom temp gauges when I cooked a whole pig, I suppose the large meat mass changed the heat flow dynamics causing more heat to be trapped on top. Last Friday I cooked 6 slabs of baby back ribs on the bottom tray and 2 slabs of spare ribs on the top tray, the temperatures between top and bottom trays stayed within 5* throughout the cook. 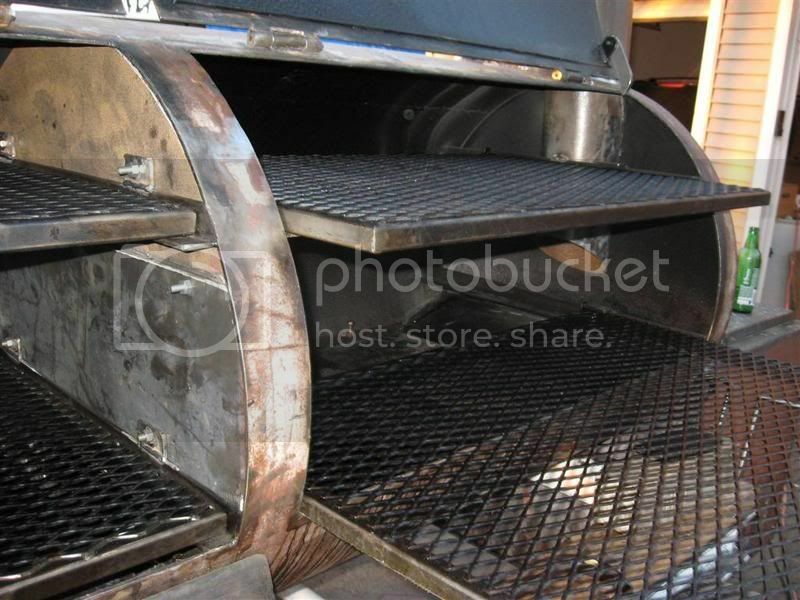 The trick for even temperatures between bottom and top grates is to create the best possible heat distribution and flow dynamics within your cooker, the bottom end of your stack and its output angle are two important factors.